Charlie Lovett's new book, The Lost Book of the Grail, is released today and I am very happy to have three copies to offer on giveaway! This giveaway is open to US residents only. About the Book: In THE LOST BOOK OF THE GRAIL (Viking; On-Sale: February 28, 2017; ISBN: 9780399562518; Price: $26.00), his fourth and most ambitious book yet, Lovett gives us his whimsical take on the legend of King Arthur and the Holy Grail. THE LOST BOOK OF THE GRAIL is a deftly layered mystery written in the bold, questing spirit of Arthurian tales. Set in the fictional English cathedral city of Barchester, the novel chronicles the story of Arthur Prescott, a middle-aged, obsessive bibliophile and Holy Grail fanatic, who for years has haplessly worked to uncover a long lost secret about the cathedral’s past and its connections to King Arthur. But it’s not until Arthur meets Bethany Davis, a beautiful young American Millennial with a penchant for modern technology, that his quest takes on new meaning. 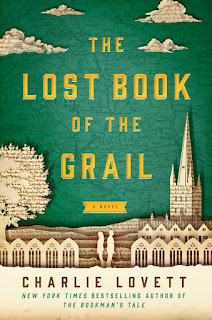 Soon Arthur and Bethany’s search takes on grave importance, leading the pair to discover secrets about the cathedral, about the grail, and about themselves that neither expected. Imbued with reverence and mythical storytelling, THE LOST BOOK OF THE GRAIL is a mystery of the kind that’s wildly popular in the entertainment world—think Indiana Jones and the Last Crusade and National Treasure, not to mention Dan Brown’s The Da Vinci Code—yet deeply ruminates on timeless themes like faith, perceived truth, and how the past has informed the present day. Here Lovett provides a wholly entertaining story that will not only make you smile and laugh, but also think—prompting readers to reconsider the important roles that spirituality, family, and, yes, reading, play in their lives. To enter, just fill in the form below by March 10, 2017.